Researchers in France conducted a study to find out whether migraine sufferers were more likely to have brain damage later on in life. The researchers found no evidence to suggest that those suffering from migraines were more likely to suffer brain damage (1). What value do you assign to studies such as this one on the link between brain damage and migraines? Do you rely on research studies to understand what may or may not happen to you in the future? After all, it seems that a new study comes around more often than not with information that appears to contradict prior studies. I cannot remember how many of these types of pieces I have read on the benefits versus risks from drinking coffee. One day, the study says that drinking coffee is good for you. The next study that comes along claims that coffee can be bad for you. Which one should you believe? It depends, right? This is not to say that research studies, such as this one, do not contain value. On the contrary, I have found many of these types of pieces to be extremely valuable in terms of understanding the links between, for example, high amounts of biogenic amines, such as tyramine and histamine, and migraines. Fact: Most of us are not statisticians or researchers. Many of us could care less about the finer points behind the numbers in the study. But, at the same time, if we don’t dig in to these numbers, it might not be possible to understand whether it is relevant to us or not. It is helpful for us to make a connection to the data, but that takes both time and effort. At the very least, a post such as this one should be written in a way that encourages you to follow up and learn more, to the extent that the topic is interesting. Case in point. The current study on the link between migraines and brain damage builds on earlier work, but also goes further. Earlier research, that was conducted using magnetic resonance imaging (“MRI”) technology, concluded that migraine sufferers were more likely to develop tiny lesions to blood vessels in the brain. These lesions result from the deterioration in small arteries that supply blood to what is referred to as “white matter”. White matter forms that part of the brain made of cells called ‘axons’, which connect one to the other so that nerves can communicate (2). White matter enables the brain to operate intact (2). The new study was conducted to find out whether those lesions could mean lower cognitive abilities. However, researchers found no link to suggest that these abrasions lead to lower cognitive function. The study validates earlier work, which showed that there was a strong association between migraines and deep white mater hyperintensity. White matter hyperintensity describes a condition where there has been more serious injury to the axons. This new study will also help researchers focus on non-migraine headaches and certain medical conditions related to older people. In addition, the work can provides some comfort to migraine sufferers, who already live difficult lives and worry about the implications of their condition. However, as migraine sufferers, we need to remember that many of the issues we face later on in life, including cognitive issues, may start developing much earlier in life. Therefore, anything we can do to naturally minimize episodes as soon as possible, can allow us to live healthier and longer lives. 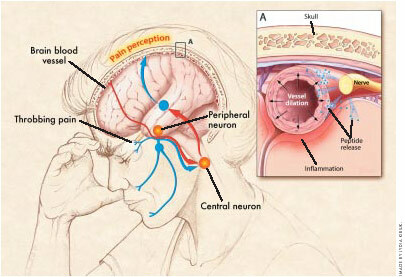 Furthermore, discovering and treating the underlying cause of the migraines themselves can also minimize future risks.